Cruise Talk: Princess Cruises Eighth Annual Relaxation Report Reveals Half of Americans Don't Get CruisePage.com - Discount Cruises, Last Minute Cruises, Cruise, Cruise Line, Cruise Vacation. 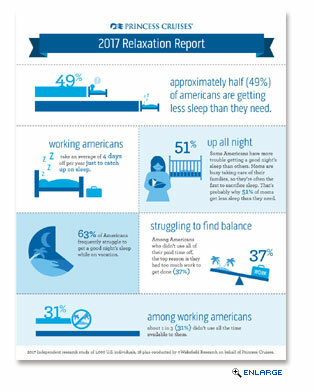 Leading up to National Relaxation Day on August 15, Princess Cruises has released the results of its eighth annual Relaxation Report, which has revealed that when it comes to relaxation and sleep, many Americans are in need of a wakeup call. According to results of the survey by Wakefield Research for Princess Cruises, Americans aren't carving out enough time in their days for sleep or relaxation, with approximately half (49%) reporting they aren't getting the sleep they need and 78% saying they don't set aside time to relax each day. Relaxation and sleep go hand-in-hand, and the lack of both appears to be catching up with Americans. Rather than getting the most enjoyment out of their vacation, working adults take an average of four days off per year just to catch up on sleep. Whether it's a full vacation or even just a few minutes of downtime, learning how to carve out more "me" time is clearly becoming a necessity. Even going on vacation doesn't guarantee better rest, according to the survey, which found that 63% of Americans frequently struggle to get a good night's sleep while on vacation. As one of the world's largest international premium cruise brand, Princess Cruises, is committed to ensuring its guests come back from vacation feeling refreshed, renewed and rejuvenated. As part of its Come Back New Promise, Princess Cruises partnered with leading experts in both the science and beauty of sleep to develop the Princess Luxury Bed. Together with board-certified sleep expert Dr. Michael Breus and designer Candice Olson, Princess Cruises now delivers its guests the ultimate night of sleep at sea. "The number one advice I give people is that sleep is a sensory experience and all five of your senses must be prepared for slumber in order for you to fall asleep easily and stay asleep all night long," said Dr. Breus. "I'm thrilled to have partnered with Princess Cruises and believe we have come up with a bed that will allow guests to achieve the ultimate in rest and relaxation." The Princess Luxury Bed is rolling out to more than 44,000 staterooms through 2019. The bed features a plush, two-inch thick pillow top, a nine-inch, single-sided medium firm mattress for enhanced support, individually wrapped coils for less partner disturbance, a European-inspired duvet and 100% luxurious Jacquard-woven cotton linens. The Princess Luxury Bed is also now available for guests to order for their homes via www.princessluxurybed.com. To prepare guests for the ultimate night of sleep at sea, Princess Cruises and Dr. Breus optimized the staterooms for a sleep-friendly sensory experience. As an extension to the sensory stateroom offerings, we offer a SLEEP by Princess Kit which includes additional sleep-inducing items such as eye shades, earplugs, aromatherapy scents, Dr. Breus' Good Night™ app and more.